Hector Barbossa is a fictional character in the Pirates of the Caribbean film series, portrayed by Australian actor Geoffrey Rush. His character was partly inspired by Barbarossa Hayreddin Pasha. Barbossa was first introduced in in the series' first installment Pirates of the Caribbean: The Curse of the Black Pearl (2003) as the villainous and treacherous captain of the Black Pearl after committing mutiny against the ship's previous captain, Jack Sparrow. Having met his demise in the climax of the film, his character is revealed to have been resurrected at the end of Dead Man's Chest (2006). In the third film At World's End (2007), it is shown that Barbossa is also one of the nine pirate lords in the Brethren Court, the Pirate Lords of the Seven Seas. In the fourth film On Stranger Tides (2011), he has become a privateer in the King's Navy and is ordered to accompany Sparrow on an expedition for the Fountain of Youth. Barbossa's first name, "Hector", was revealed in a director's commentary on the Curse of the Black Pearl DVD, but was not revealed by any of the characters until the third film of the series (when they rescue Jack Sparrow, and Barbossa greets him, Sparrow says: "Ah, Hector! It's been too long! Hasn't it?"). It was revealed that co-star Johnny Depp played a decisive part in providing the name. In Pirates of the Caribbean: The Curse of the Black Pearl, Barbossa is captain of the pirate ship, the Black Pearl. His plan is to break the Aztec curse he and his crew are under and bring an end to Jack Sparrow, one of his arch rivals. He was originally the ship's first mate under Captain Jack Sparrow (Depp). Barbossa persuaded Jack to reveal the bearings to Isla de Muerta where the Chest of Cortés, containing 882 pieces of Aztec gold, was hidden. After Sparrow divulged the location, Barbossa and the crew mutinied and marooned Sparrow on a tiny island, with only a single-shot pistol with which to commit suicide. Barbossa was convinced for the next ten years after the mutiny that Jack was killed by starvation. However, unknown to Barbossa, Jack made a deal with rum runners to take him off the island after three days, swore to use the pistol's single shot to kill Barbossa, and spent the next 10 years seeking revenge. Barbossa and the crew found the Aztec treasure, but ran afoul of a curse placed upon the gold by the Aztec gods, which rendered the pirates undead. To lift the curse, the crew had to return all 882 coins to the chest and offer their blood. They still need their former shipmate Bootstrap Bill Turner's blood; Turner was the lone holdout against the mutiny, and believing the crew deserved to remain cursed for betraying Jack, sent one coin to his son, Will (Orlando Bloom). In retaliation, Barbossa tied Bootstrap to a cannon and threw him overboard. For years, Barbossa searched for the last coin, which was now possessed by Elizabeth Swann (Keira Knightley), daughter of Governor Weatherby Swann (Jonathan Pryce). Barbossa sets sail for Port Royal after detecting a "signal" when the coin touched the sea. Unknown to him, Jack Sparrow is also in Port Royal. Believing Elizabeth is Bootstrap's daughter (and thus, the means to breaking their curse) after she gives her name as Elizabeth Turner, Barbossa makes off with her and the medallion. He reveals their cursed state en route to Isla de Muerta. Elizabeth's blood is offered, but the ritual fails. Will, aided by Sparrow, rescues Elizabeth and escapes with the medallion. Sparrow is taken prisoner aboard the Pearl, and Barbossa pursues the Interceptor. Catching them, Barbossa learns Will's true identity and tricks Will into believing that Jack, the crew, and Elizabeth will be freed. He instead maroons Jack and Elizabeth on a deserted island (the same one he marooned Jack on years before) while, inspired by an idea of one of his crew, he takes Will to Isla de Muerta to be killed to break the curse. Before the final battle, as Barbossa is about to kill Will, Sparrow makes another unexpected return to Barbossa's astonishment at his escape. When he threatens to kill Jack too, Jack reveals to Barbossa that he has led the British Royal Navy to the island and he convinces Barbossa to capture the HMS Dauntless, leaving Jack the Black Pearl. While the pirates battle the Royal Navy, Jack reveals his trickery and duels Barbossa (after having secretly swiped a cursed coin). Barbossa stabs Jack during a duel, but Jack reveals that he holds a coin and is now also cursed, and thus immortal. When Barbossa attempts to kill Elizabeth, Jack fatally shoots Barbossa with the pistol after Will tosses his coin with his blood on it into the chest, breaking the curse. As he bleeds from the bullet wound his last words are "I feel...cold." In a post credits "Easter Egg" scene, Barbossa's pet monkey, Jack, steals a gold coin from the Chest, thus cursing itself once again. Barbossa is resurrected during the second film, although he does not appear until the final scene. Having met his demise in the previous installment, Barbossa is resurrected by Tia Dalma (Naomie Harris) in order to save Jack Sparrow from Davy Jones' Locker after Sparrow meets his demise against the Kraken, ending Dead Man's Chest in a cliffhanger. During the scene at Tia Dalma's hut, someone's lower body can be partially seen lying on a bed in a back room; this is most likely Barbossa. Jack the Monkey perches on a boot-clad leg, alluding to Barbossa being resurrected. Jack Sparrow holding Barbossa's feathered hat is also a subtle clue that the captain will return. In the movie, Tia Dalma says they will need a captain who knows the waters of World's End. Barbossa enters, biting into a green apple, showing his fully restored human form. To keep Barbossa's return a surprise, Rush was not credited for his role. Barbossa joins forces with Will, Elizabeth and the Black Pearl crew to rescue Jack from Davy Jones' Locker. To reach World's End, the gateway to the Locker, Barbossa needs the navigational charts belonging to Sao Feng (Chow Yun-fat), the Pirate Lord of South China Sea. During a meeting with Feng, Barbossa and Elizabeth admit that they are planning to retrieve Jack Sparrow, Feng's enemy. Feng is furious over an earlier attempt by Will to steal the charts, but after the East India Trading Company attacks his bathhouse, he is persuaded to loan them the charts and a ship, although only after making a secret deal with Will. Barbossa and the crew sail to World's End, eventually arriving in Davy Jones' Locker. There they find Sparrow and the Black Pearl, though Sparrow initially believes they are hallucinations. Sparrow finally agrees to be rescued, though he and Barbossa continually dispute who is captain. Jack and Barbossa eventually command different sides of the ship, often while issuing orders simultaneously. While searching for an escape route, Sparrow and Barbossa form a tenuous alliance when Jack is told that Cutler Beckett (Tom Hollander) now possesses the heart of Davy Jones and is purging piracy. Jack learns that whoever stabs Davy Jones' heart will become immortal, and instead plots his own course. Returning to the living world, the crew sight land and stop to restock supplies. Distrusting one another, both captains go ashore with a landing party, leaving Will temporarily in command, still unaware he has a deal with Sao Feng. While ashore, they find the dead Kraken, killed by Davy Jones under Lord Beckett's order. Barbossa tells Sparrow that as two of the nine Pirate Lords, they must attend the Brethren Court convening at Shipwreck Cove, although Jack refuses, intent on seeking immortality. A surprisingly eloquent Barbossa urges Sparrow to look beyond his own self interests and consider the greater good, telling him piracy is being exterminated and there is little nobility or purpose in being the only pirate left in the Caribbean; he will be doomed to the same fate as the Kraken—the last of its kind. Sao Feng arrives in his warship, the Empress, claiming the Pearl and betraying Will. Barbossa negotiates a new deal with Feng and implies that Calypso, goddess of the sea, is aboard the ship, trapped in human form. Believing Elizabeth is Calypso, Feng demands she be traded to him for the Pearl. Elizabeth, furious over Will's deception, agrees to go with Feng to protect the crew. Will is thrown into the brig by Sparrow as Barbossa and Sparrow head to Shipwreck Cove, after escaping Lord Beckett, who arrived at the island. It is revealed (or at least strongly implied) at Shipwreck Cove, that Tia Dalma, who is in fact Calypso in human form, resurrected Barbossa not only to help retrieve Sparrow, but to free her from her mortal form. After she angrily reminds him of the reasons she bought him back, Barbossa points out that she needs to keep him alive, since he is also one of the pirate lords. At the Brethren Court, Barbossa proposes releasing Calypso from her human form to help them fight Beckett. He argues that the first court imprisoned the goddess only because it served their own needs, but in doing so, they provided an opportunity for forces like Beckett to threaten them. The other lords remain opposed, however, fearing the sea goddess' power and retaliation. Meanwhile, Elizabeth Swann, who has succeeded Sao Feng as the Empress' captain and the Pirate Lord of Singapore, arrives at the court. The Lords argue over going into battle and releasing Calypso. According to the Pirata Codex, only a Pirate King can declare war. The lords move to elect one, but historically, each Lord only votes for himself, resulting in a continual stalemate. In a surprising upset, Sparrow votes for Elizabeth, though it is only to serve his own scheme. As "King", Elizabeth declares war against Beckett. As the pirates prepare for battle, the horizon fills with Lord Beckett's massive armada. Barbossa, who tricked the other pirate lords into yielding their "Pieces of Eight" rank insignias, frees Calypso in a ritual, stating that his fate has been out of his control for too long. He pleads for her intervention, but Calypso refuses to aid those who kept her imprisoned; her fury creates a giant maelstrom. Barbossa takes the Black Pearl into battle against the Flying Dutchman; amidst the combat, he reluctantly pronounces Will and Elizabeth married. After Beckett's defeat, Elizabeth leaves to reunite with Will for their "one day", while Barbossa again commandeers the Pearl, stranding Jack and Gibbs in Tortuga. The crew demands that Barbossa share the bearings to the Fountain of Youth, mirroring the original mutiny that made Barbossa the Pearl's captain. Barbossa agrees and unrolls the chart, only to discover that Jack has removed its middle. In Pirates of the Caribbean: On Stranger Tides, Hector Barbossa is now a privateer in King George II's Royal Navy. Barbossa reveals that the Black Pearl was attacked off the coast of Hispaniola by the Queen Anne's Revenge, Blackbeard's pirate ship. Using his magical sword, Blackbeard made the Pearl come alive, attacking its own crew. Barbossa believes the ship was destroyed, and that he is the only survivor, though he escaped by severing his leg. He now uses a peg leg and crutch and regrets the fact that he did not go down with the Pearl after the attack. Although Barbossa claims the British Navy recruited him by offering a "nice retirement package", his true intention is to seek revenge against Blackbeard. King George summons Barbossa for a meeting and there Barbossa realizes that the King has captured Jack Sparrow to commission him as a crewmember of Barbossa's. Barbossa suggests to the king that he chains Jack back to his chair to avoid escape but the king refuses unaware that his refusal has sealed Jack's escape into reality. Jack does so escape and Barbossa is sent on an expedition to locate the Fountain of Youth before the Spanish, led by an unnamed person called the Spaniard. Barbossa, commanding the HMS Providence, forcefully enlists Joshamee Gibbs' help to find the Fountain since Gibbs destroys the charts from the previous story to save himself from being hanged; and pursue the Queen Anne's Revenge. Blackbeard, with Jack Sparrow now aboard, arrives at Whitecap Bay. The crew captures a mermaid and when the Providence arrives to the caribbean they find the shattered remains of a bell tower that helped summon the mermaids; the Providence is sunk during a mermaid attack forcing Barbossa and the crew to search for the Fountain on foot. Barbossa hikes through a rainforest and secretly collects poison frogs to poison his sword with for a final fight with Blackbeard; to cover up his intentions he claims he has a hobby for collecting frogs. He finds Sparrow alone at Juan Ponce de León's decaying flagship but realize the chalices are missing; the Spanish found them first. Barbossa and Jack enter the camp and take the chalices, but the Spanish recognize them as enemies and arrest them. Barbossa reveals to Jack about his true intentions and they both escape in a final struggle for the chalices. The two agree to join forces against Blackbeard, and Sparrow leads Blackbeard's crew into a trap located at the fountain, where Barbossa engages Blackbeard in single combat. After a long battle, Blackbeard manages to tire Barbossa out and trips him. Seemingly defeated with him trapped to the ground and most of his men killed, Barbossa distracts Blackbeard with the fact that the Spanish have arrived at the fountain. While the Spaniard has his men destroy the fountain, Barbossa gets up and fatally stabs Blackbeard with his poisoned sword, then claims Blackbeard's magical sword, the Queen Anne's Revenge, and assumes command of Blackbeard's crew. He then leaves with his crew for Jack to finish Blackbeard off using the ritual method. Renouncing all ties to the Crown, Barbossa reverts to piracy and his alignment as being a hero or villain in future installments is once again questioned. However, unknown to Barbossa, the Black Pearl was never destroyed, but had been magically shrunk by Blackbeard. The tiny ship is now back in Jack's possession, who now seeks to find a way to restore it to normal size. Geoffrey Rush had commented on returning as Barbossa in a fifth Pirates of the Caribbean film, saying "If they keep shapeshifting this character, absolutely" as well as implying he may return as the villain. He also said that Barbossa's megalomania "could explode in horrific ways." In December 2014, Rush confirmed his return for the fifth installment Dead Men Tell No Tales where Barbossa and Sparrow were "at the heart of it and there's a whole new set of story lines." In the "Becoming Barbossa" featurette on the "Lost Disc", Geoffrey Rush shared his personal take on Barbossa's history: he was born in 1685, his family was noble but poor, and he ran away from home when he was 13. He went to the sea, and seeing how well the captains and officers lived, decided to become a captain himself. At first, he wanted to be an honest seaman, but quickly recognized that piracy was easier and more lucrative. His family name indicates a Spanish or Portuguese origin. In At World's End, Hector Barbossa is revealed to be one of the nine Pirate Lords of the Brethren Court. He is the Pirate Lord of the Caspian Sea, although as that body of water is endorheic, he pirated elsewhere, eventually settling in the Caribbean and joining Jack Sparrow's crew. His position as Pirate Lord of the Caspian Sea is revealed in the updated Complete Visual Guide. In Pirates of the Caribbean: The Price of Freedom, Barbossa is the pirate captain in the Caribbean. After his schooner, the Cobra, is attacked and destroyed by the infamous rogue pirates, he goes to Shipwreck Cove to inform the Pirate Lords of his disaster. With the help of a young pirate Jack Sparrow, Barbossa discovers that the leader of the rogues is Borya Palachnik, the Russian Pirate Lord of the Caspian Sea. After he was captured and sentenced to hang, Borya gave his Piece of Eight to Barbossa, thus making him the next Pirate Lord of the Caspian Sea. Hector Barbossa is fond of apples, which appear throughout the first film. He offers one to the captive Elizabeth and later tells her that once the curse is lifted, he wants to eat a whole bushel-full. There are also apples in his cabin, and when Jack is taken to the brig, Barbossa grabs the apple Jack was eating and throws it in the water in anger. When he dies at the end of "Curse of the Black Pearl", an apple rolls from his hand that he apparently brought to eat when the curse was lifted. His cameo appearance at the end of Dead Man's Chest shows him biting into his favorite fruit. In At World's End, he is only shown eating one apple when aboard the Black Pearl. In On Stranger Tides, he is seen eating apple slices aboard his ship. According to the audio commentary from the first Pirates of the Caribbean DVD (featuring the scriptwriters), Hector Barbossa is skilled with a sword, and is considered one of the finest swordsmen in the Caribbean. According to the commentary, Barbossa's skills are equal to James Norrington (Jack Davenport) and exceeded only by Will Turner. His prowess with a blade is evident in his duel with Jack Sparrow, and in the maelstrom battle against the East India Trading Company. In the first film, the Black Pearl crew were hesitant to attack Hector Barbossa, even simultaneously. The only person known to have survived a one-on-one duel with him is Jack Sparrow, in the treasure caves of Isla de Muerta—and even that was with the aid of a pistol. Geoffrey Rush comments that Hector Barbossa supposedly used a sword from a very young age, possibly as early as 13. He uses the same flag as the notorious pirate "Calico Jack" Rackham. 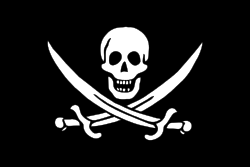 Hector Barbossa's Jolly Roger, which was originally the flag of pirate Calico Jack. In Pirates of the Caribbean: The Visual Guide, Hector Barbossa is described as being attentive to his appearance, as his elaborate clothing shows. He wears a large ring bearing a lion's head symbol and has purplish blue ostrich plumes and a pheasant feather in his hat (which appears to be important to him, as in the first movie Jack Sparrow interests him in a bargain by saying, "and I'll buy you a hat... a really big one"). His coat buttons are made from recast Incan silver, and his pistol once belonged to a Spanish pirate, won in a duel. Hector Barbossa is one of only five Disney villains ever nominated for the MTV Movie Award for Best Villain, the others being Davy Jones, Scar from The Lion King, Jadis the White Witch in The Chronicles of Narnia: The Lion, the Witch and the Wardrobe and Lots-O'-Huggin' Bear from Toy Story 3. Hector Barbossa appears as a villain in the Pirates of the Caribbean setting, Port Royal, of Kingdom Hearts II. In the game, his role is copied and pasted from the film, with the exceptions of the presence of Sora, Donald and Goofy, his alliance with Pete and Maleficent, and his control over the Heartless. Due to the filming of the two sequels back-to-back, which resulted in Geoffrey Rush being unavailable, Hector Barbossa was voiced by Brian George in the English version. In the Japanese version, he is voiced by Haruhiko Jō. Barbossa was made into several action figures by NECA. He appeared in the first wave of Curse of the Black Pearl figures in his human form; that same figure would be re-released as part of the fourth wave of Dead Man's Chest toys. Barbossa's cursed form was released as a box set, which also featured Jack Sparrow as a zombie, and the chest of cursed Aztec gold. Then, he was also released in the At World's End figure line. However, he did not come with Jack the Monkey, who was released in a figure set along with Marty. Lastly, Barbossa was featured in "At Stranger tides" action figure wave with his peg leg and privateer suit. Barbossa was made as a plush toy for the M&M Dead Man's Chest. ↑ Scott Holleran (2003-05-31). "Interview: Ted Elliott & Terry Rossio on 'At World's End'". Box Office Mojo. Retrieved 2007-06-06. ↑ Nancy Stadler. "Geoffrey Rush isn't rushing to exit Disney's "Pirates of the Caribbean" film franchise". Jimhillmedia.com. Retrieved 2014-08-17. ↑ Mary Margaret. "Geoffrey Rush On 'Pirates' 4: Jack Sparrow Has Met His Match". Parade.com. Retrieved 2014-08-17. ↑ Evans, Laura, Nauman, Zoe (2014-12-09). "'He knows Australia quite well! ': Geoffrey Rush says Pirates Of The Caribbean actor Johnny Depp has enjoyed secret trips Down Under ahead of Gold Coast filming". Daily Mail. Retrieved 2013-12-10. ↑ Orlando Parfitt (12 November 2009). "Top 15 Fantasy Villains". IGN. Retrieved 2 February 2011.